Looking forward to turning your camping dreams into a reality this year? The Great Lakes are an obvious escape for midwestern vacationers, but the campgrounds can be especially congested this time of year. Lucky for us, these lakes are ginormous, and it’s easy to get away from the crowds if you know where to look. Get ready for sand-crusted swimsuits, reading by firefly light, and wet and wild adventures that can only be found in and around the greatest lakes on earth. 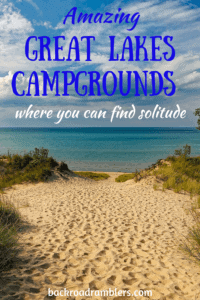 Here are some hidden gems for Great Lakes Camping that will help you escape the throngs and embrace your inner mermaid. No matter what recreational pleasure calls to you, you’ll find it at Split Rock Lighthouse State Park on the rocky shores of Lake Superior. 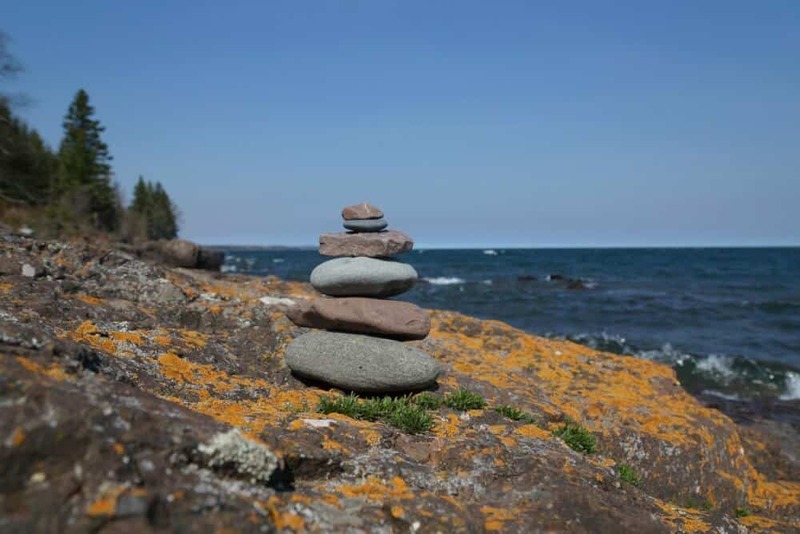 Hikers and backpackers can easily connect to the world-famous Superior Hiking Trail, a 296-mile footpath that follows Lake Superior’s wild and scenic shore. The paved, Gitchi Gami State Trail is a work-in-progress, but one that will eventually let you hop on your bike and cover 86 miles of shoreline from Twin Harbors all the way to Grand Marais. The famous Split Rock Lighthouse, built in 1909 after several tragic shipwrecks occurred near the rocky shoreline, is said to be the most photographed lighthouse in the United States. You’ll also find pristine, pebbly beaches, scenic waterfalls, and primitive, shoreside camping. Secluded backpacking, boat-in, and cart-in campsites are what make camping here so special. 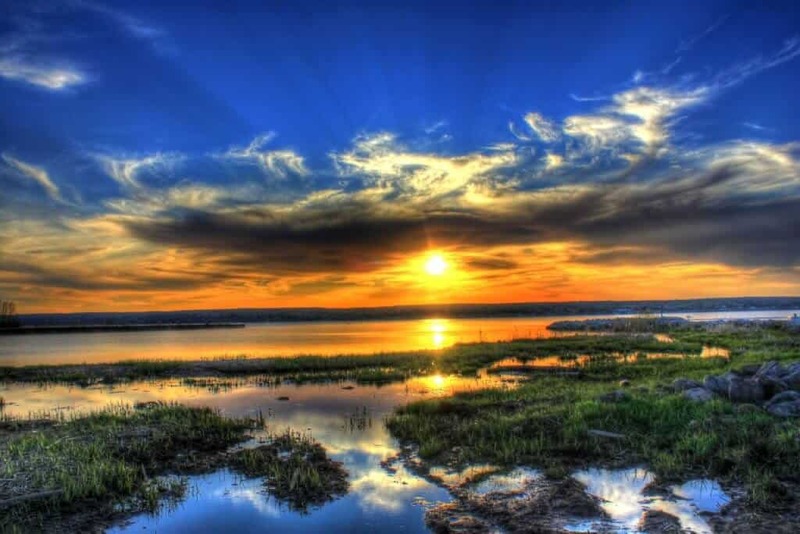 Each and every site is secluded and many are waterfront, with incredible views of the lake and her magical sunrises. What we love about Split Rock Lighthouse: Camping is available year round! Something to consider: There are no restaurants, gas stations, or stores nearby, so make sure you come prepared. Despite the fact that Fisherman’s Island no longer exists as an island, this tract of unspoiled Lake Michigan shoreline is still a ruggedly charming getaway for hikers, boaters, anglers, and lovers of wildlife. Characterized by lush forests, a plethora of native wildflowers, rolling sand dunes, and boggy wetlands, you could spend weeks exploring this conglomerate of incredible ecosystems. Rustic campsites, some nestled right in the dunes, are divided up between north and south units with a mile-long sandy beach between them for swimming and sunbathing. The swimming area is quite shallow, even if you venture far from shore, and the sandy bottom is easy on the feet, making this a perfect spot for families with youngins in tow. You may find crowds on the hottest of summer days, but the rest of the year, Fisherman’s Island is blissfully quiet. What we loved about Fisherman’s Island State Park: Waterfront camping! Something to consider: According to locals, the beach here is a great spot to hunt for Petoskey and Charlevoix stones. We had no idea what we were looking for, so do your research ahead of time. Located on Madeline Island, the largest of all the Apostle Islands in Lake Superior, Big Bay State Park can only be reached by boat. If you don’t have access to one of your own, simply hop aboard the Madeline Island Ferry in Bayfield, for a 25-minute cruise across the lake, which will set the stage for your midwestern island vacation. Once you arrive in La Pointe, it’s a 6-mile drive, walk, or bike ride to Big Bay State Park. You’ll be greeted by towering sandstone bluffs and an expansive sandy beach. The campground is spacious and there’s plenty of privacy, especially at the walk-in sites. Once settled, get busy exploring the miles of trails, quiet lagoons, hidden sea caves, and fabulously cold water of Lake Superior. It’s an island paradise if ever there was one. What we love about Big Bay State Park: The sea caves are really cool. You can see them from the trail, or rent a kayak for a closer look. Something to consider: Raccoons are a little too friendly. 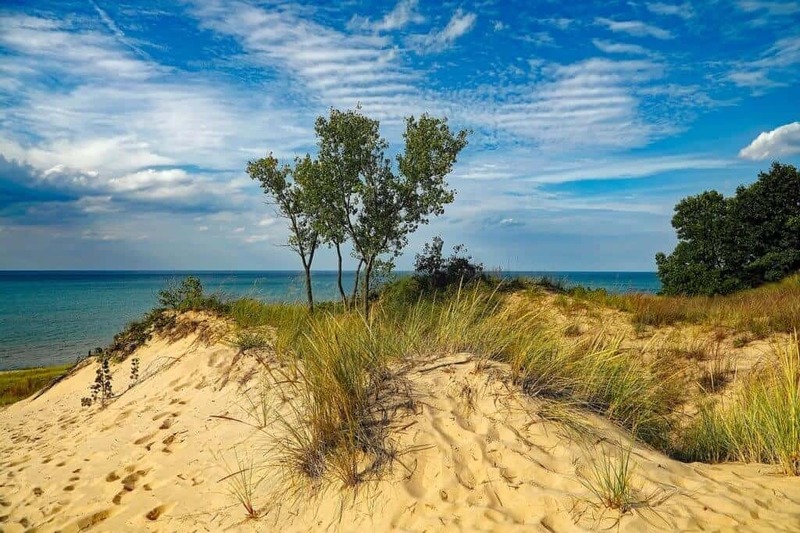 Just a stone’s throw from the metropolitan realm of Gary, Indiana, the spectacular Indiana Dunes National Lakeshore boasts some of the most biologically rich ecosystems in the nation. 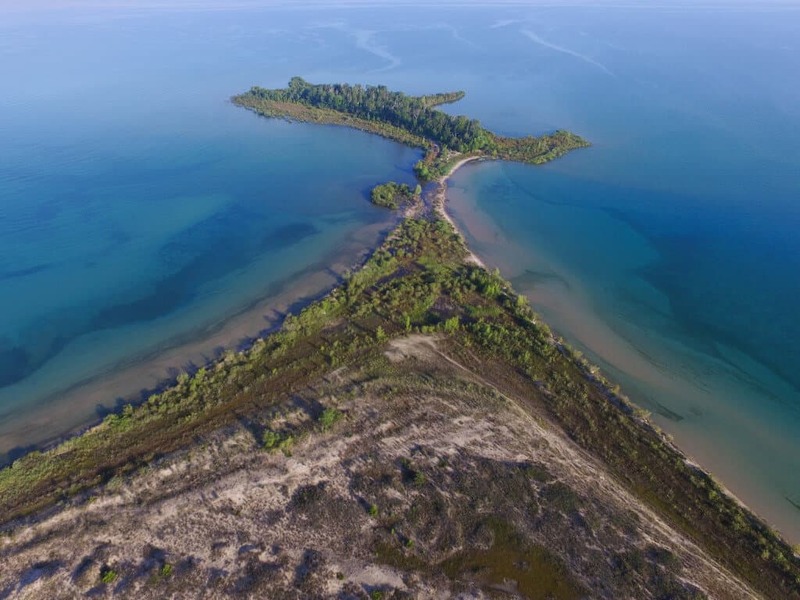 This 15,000-acre park on the shores of Lake Michigan contains more than 1,100 native plant species, world-class birding, and 50 miles of hiking trails. Although the park sees a lot of visitors in every season, you’re always a short walk, swim, or paddle from total solitude. The Dunewood Campground operates without a reservation system, so claim your spot early to give yourself plenty of time for exploring. The 13-walk-in sites are prime real estate and worth every extra step you have to take to get there. What we loved about Indiana Sand Dunes National Lakeshore: Hiking along the dunes and the sandy beach. Something to consider: Consider camping out here before or after the kids go back to school. It will make it much easier to get a spot. Ready to plan your getaway amidst the crashing waves, towering headlands, and sandy beaches of the Great Lakes? 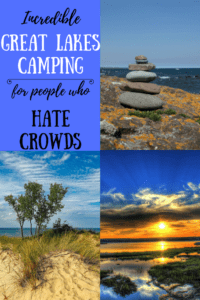 Start with these incredible campgrounds and the fun will take care of itself. Are you on Pinterest? I’d love it if you would share the image below. Thank you!! As a Chicago native, I’m so sad I didn’t see this most earlier. I’ve moved since then, but will definitely be using this list to make pack a little extra into my stays in Chicago. I’m going to show this to my husband. We just moved to Chicago last year and don’t really know where to camp. We are used to places in Arizona that don’t have crowds. He’ll love this! These places look and sound gorgeous! I live in WI, so any one of these would be great for us to visit this summer. Thanks for the suggestions!